We all like stuff. Some of us like cars. Some of us like boats. Some of us like technology. Some of us like collectibles and trinkets. 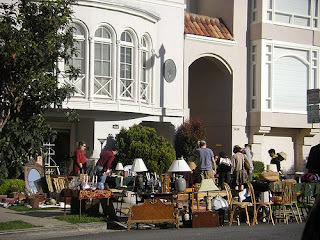 Have you ever considered that everything you own is going to end up in a garage sale someday? That's right. Not long after you pass away, family members will be combing through all of your worldly possessions deciding what they will keep for themselves and what will go into a huge estate sale. Personally, I hate stuff cluttering up my house, and it's a constant battle of getting rid of stuff that you don't really need, especially when you have two young children in the home. I'd rather give, save, wisely invest my money, and make only necessary purchases. So, the next time you're buying birthday or Christmas presents for your children, ask yourself, "do my kids really need five presents each, especially when other family members will be buying them gifts as well?" Or, the next time you're out running some errands and you run across an item in the store that you absolutely "just have to get," just remember the great big garage sale that's coming after you have left this earthly life. The simple life really is a better life. Do not store up for yourselves treasures on earth, where moth and rust destroy, and where thieves break in and steal. But store up for yourselves treasures in heaven, where moth and rust do not destroy, and where thieves do not break in and steal. For where your treasure is, there your heart will be also (Matthew 6:19-21, NIV).